Many components in your phones and batteries are made with “rare Earth metals.” You know why they call them that? Because they are actually rare on Earth, and we’re going to run out. But they’re not rare in space. Which is why today a company launched the prototype for a vehicle that will search for asteroids to mine beyond Earth. The Arkyd 3, launched successfully last week from the International Space Station, begins a 90-day low-Earth orbit mission to test its software and control systems. If all goes well, it will be followed in December by the Arkyd 6 spacecraft (pictured above), which will test a mid-wave infrared sensor, which could take measurements from the surface of asteroids in order to detect metals and water. Of course, the Arkyds aren’t just on the prowl for rare Earth metals like neodymium and yttrium. The Arkyd 6 will look for any precious metal, and also water. If we can find water deposits locked up in local asteroids, it would be a huge help for space vessels that need to stock up on the life-giving liquid (and fuel source) during long journeys. 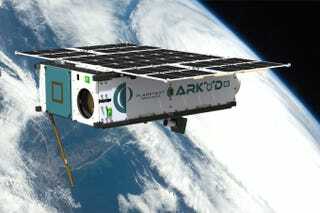 The Arkyd 3 is also known as a “prospector” ship, and was created by Planetary Resources, a private space agency funded in part by Larry Page, Richard Branson, and other techno-utopian entrepreneurs. But the Arkyd missions are also part of an ongoing effort by public and private groups to make asteroid mining a reality. Late last year, ESA’s Rosetta spacecraft landed the Philae probe on a moving comet, which could be viewed as an early proof of concept for asteroid mining operations. The Rosetta mission showed that it isn’t unrealistic for us to make plans to set up a mine on an asteroid, using remote-controlled equipment. The successful deployment of the A3R is a significant milestone for Planetary Resources as we forge a path toward prospecting resource-rich asteroids. Our team is developing the technology that will enable humanity to create an off-planet economy that will fundamentally change the way we live on Earth. Not only could space mining help supplement diminishing resources on Earth, but it could also usher in a new space age. One of the main problems with getting humanity off the Earth has been funding. Mining could provide the space industry with a source of funds, and maybe turn the asteroid Ceres into the next gold rush town.